Ageing IFP leader Mangosuthu Buthelezi has finally thrown in the towel after being at the helm of his party for more than four decades. Buthelezi dropped a bombshell at a media briefing in Durban on Sunday when he announced that he would not stand for re-election as IFP president during the party’s upcoming national general elective conference. The IFP leader‚ who has been at the helm of the party since founding it in 1975‚ said the party’s extended national council had agreed to nominate Velenkosini Hlabisa‚ the mayor of Hlabisa in northern KwaZulu-Natal‚ to stand for the leadership. Buthelezi has described Hlabisa as a leader of integrity who has served the IFP with distinction and who has the support from the party’s structures. He said the proposal that Hlabisa stand for leadership has emanated from across the party. “We therefore support him. The Extended National Council opened the floor to all our leaders to indicate whether they wish to stand for nomination. We did not receive any indication from among our leaders. 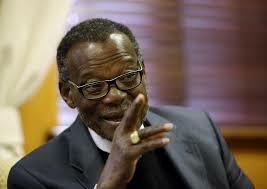 Thus Mr Hlabisa presently stands as our only nominee‚” said Buthelezi. However‚ he said this does not prevent anyone from throwing their name in the ring during the conference. Buthelezi said that should Hlabisa be elected to lead the IFP‚ he has made himself available to work alongside him “in whatever way our members see fit‚ for as long as my health allows”. “While I will no longer be at the helm‚ and would submit in all things to the leadership of the party‚ I am prepared to assist the IFP in as far as possible to ensure that it can play the role it needs to play in South Africa‚” said Buthelezi. The 89-year-old veteran politician resigned as IFP leader in 2004 but was urged twice by the party’s national council to stay on as leader. He has previously refused to speculate on when he would retire and often retorted angrily to the question but had reiterated his position that he would not quit as long as the IFP’s national council wanted him to stay. “It’s known that it was merely at the request of my party and not that I wanted to lead‚ because I’m a loyal cadre of my party‚” he has said before.